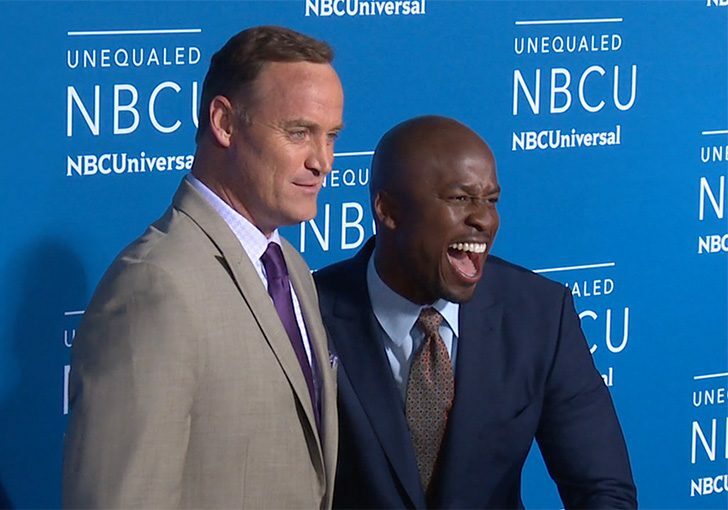 Comedian/Actor Matt Iseman and former NFL player turned sports analyst Akbar Gbajabiamila– who work together hosting USA’s Team Ninja Warrior– appeared together on the red carpet at the NBC Upfronts… and it seems like they needed some attention. While we’re all for celebrities having some fun on the red carpet, the two of them made silly faces, did ninja kicks- more than once- and Iseman even showed off his biceps through his suit. It was all a bit much, seeming like an over the top cry for some red carpet attention and promotion for their show. Sure, the paparazzi bought into it, egging them on to do another kick, but, to us, it came off slightly ridiculous. While there’s a time and a place for everything, we’re not sure the red carpet is the place to be doing ninja kicks- whether to promote your show or otherwise. That’s just our two cents. Take it for what it’s worth.